Beef Jerky Recipes » Blog Archive » What’s a “Jerky Shooter”? A pretty popular device amongst homemade Jerky chef’s is the “Jerky Shooter”. You might find that a few of the recipes you find on the site call for the use of a Jerky Shooter, but the odds are you don’t know what one is, how to use it, or where to buy one. Well I am here to assist you. Most any jerky recipe that are “chopped and formed” call for some sort of Jerky Shooter device. What is it? 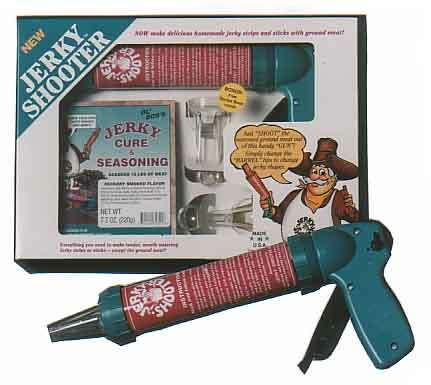 – A Jerky Shooter is a mechanical device that consists of a handle, a trigger, and a nozzle head that is used to dispensed ground meat into even strips. Nozzle heads usually have interchangeable tips to help you get the right shape and consistency you’re going for. It is very similar in look and functionality to a caulking gun at your local hardware (just don’t use one of those). How to use it? – It’s really quite simple, what you want to do is take whatever meat type you are working with and run it through some sort of food processor to get a ground meat consistency. Pack the ground meat into the nozzle end of the Jerky Shooter, making sure it’s pretty compact. Then aim the nozzle end towards to cooking surface you will be using, probably some kind of cookie sheet or wax paper. Then begin to squeeze the trigger gently to release the meat into uniform strips onto your surface. It’s as simple as that, now you are ready to begin dehydrating it. Now all you have to do is follow the instructions to whatever dehydration method you have chosen. For a great example of a finished product, check out Buffalo Bills – Venison Jerky. As for where to find one, I recommend the innovators of the product. The Midwestern Research Company located in Emporia, Kansas. Here you can find the original jerky shooter. 🙂 Enjoy!